Many people are curious if SAP certification exams are based on a mandatory set of prerequisites, such as participation in a series of training courses or job experience. 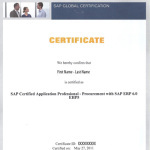 This post will provide actual information about the SAP certification prerequisites. Surprisingly enough the prerequisites for the certification depend on the geographical location of SAP academy. For example, in the United States there is no course or set of courses required in order to take a particular certification exam. Nevertheless, SAP has a listing of recommended courses to help you prepare. In addition, you do not have to have completed a lower level (associate) exam in order to take a higher level (professional) exam; however, many professional-level certification seekers may find it valuable. The situation is different in Asia Pacific Japan region. All candidates registering for SAP Certification Test must ensure that they have at least 2 years SAP implementation experience or have attended at least 15 days of relevant training in SAP. Proof of the above must be presented upon registration. If you are going to register for SAP Certification Test, it is advised to check with local SAP institution, which administers the test, what are the requirements and SAP certification prerequisites in your country. You should normally be able to find contact details on the official website of SAP in the section of Training and Education. Try to be patient with SAP website, because due to the fact that it has a lot of fancy images, it sometimes takes quite some time before it completely loads. Good luck with the certification! Prerequisites say I have to have at least 15 days of relevant training, does that mean 15 days of training from SAP authorized institutes ? What if I get a local institute ? Is there any third party which can provide SAP certification? Yes, it has to be from an authorized institute. Local institute can be authorized. However, if it is not authorized than you will not be allowed to write the certification exam. Yes, for example, Pearson VUE. can i do sap certification i.e. write exam directly without any training in dubai centre (pearson)?? Yes. Make sure to make a phone call to Pearson center before registering in order to get the final confirmation that you fulfill their SAP certification prerequisites. Good luck with you SAP certification! what criteria shud I meet to take up exam in Dubai or outside india?? You can just register for SAP certification. There is not special SAP certification prerequisites for the associate level. I am in KSA for project but I am from India. working in Wipro technology. I have implemented Simple Finance in KSA. Now i want to go for certification S4 HANA. but i am not getting the payment link or registration. in which currency i need to pay the amount. I am FI certified also. Please help fro the same. i want to write the certification exam directly in dubai…can independent consultants directly write the exam in dubai without going for training…? Please Note:We are no longer taking application from Indepdent candidates, provide us your s-user to accept your application.If fails to provide, application will not be accepted. what does it mean …independent consultants can write the exam or not? Well, it seems that if you don’t have an S-user ID, you cannot be admitted for the certification. This is what I understood from the message you posted above. Is SAP changing SAP certification prerequisites? i am taking a training through my cousin in SAP(HCM)and that training in final stage and i am planing to come dubai for examination, so plz can u guide which institute suitable for examination or certification because i am leaving pakistan in pakistan you should registered with any training center and then give exam. Please have a look at this post: SAP Certification in Middle East and North Africa for detailed prerequisites for SAP certification in Dubai. can any one clear me the prerequisite for CRM and SCM and even for MM and PP? I am planning to do SAP SD certification but have no idea where to start off. I just completed my MBA last june and working in sales domain, my company is an SAP partner. Can someone please let me know more about this certification. I have no idea of what this is going to be and also the prerequisites to do the certification. I am from India. Is it required that your employer (which is business process outsourcing) is a registered SAP Partner? There are some rules like this in Asia but not in the rest of the world. Is that rule applicable to sap philippines? When i inquire to them personally, they just told me that the requirement is to have at least 2 years of work experience with or finish an accredited sap academy (kaisa and fasttrack only). SAP changes rules all the time. Trust the information that you received from your SAP Education office in your country. sir if i do training in local institute which is not authorised can i eligible for certification exam . I am working as a SAP-SD consultant for more than 5 Years. I want to apply for SAP SD certification. How Can I proceed further. This kowsiq from Bangladesh. I am a SAP ABAP programmer. ABAP training provided by PWC ABAP consultant. I am working on a local company in Bangladesh which is using SAP ECC and HANA DB. I have three years experience as a ABAP programmer in this company. I have completed a online training on HANA and S4HANA. So for certification exam, what can I do? Please give me a advice. Which document I will provide for certification exam? I am pursuing MBA in finance from Indore,India.I want to apply for SAP Associate level,is this useful for me?and how can I apply for it in India? I have read your post and I am impressed with your content. I totally agree with “SAP has a listing of recommended courses to help you prepare”. I want to give you a simple advice and it’s very important for your career path – You should get the training from any reputed training center such as – Koenig Solutions. I am a mechanical engineer from India, can i register for SAP? If I have no experience in SAP MM,but I want to get SAP mm certification from Singapore. Am I eligible for this exam? Next Next post: What is SAP?